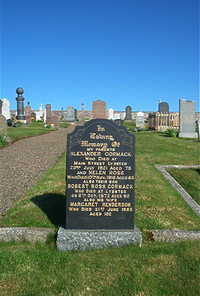 Alexander Cormack died at Lybster 23rd July 1921 aged 78. Wife Helen Ross died 10th November 1916 aged 63. Son Robert Ross Cormack died at Lybster 6th October 1972 aged 90. Wife Margaret Henderson died 21st June 1985 aged 102.